GUIZIOU Franck / hemis.fr / Getty Images. Wondering where to go for the best vacation experience in November or December? Since this is a challenging time of year for travelers, it's advisable to be well-informed about the weather and other factors that can affect your journey. Hurricane season officially ends on November 30, so it's safe to visit the Caribbean. There's good news for skiers, too, since most of the northern hemisphere is heading toward winter as the year comes to a close and mountain regions become dusted with snow. Couples who prefer a warm-weather vacation in November or December will have to travel south to find balmier temperatures — and prices begin their uphill climb toward the high season. In the USA, the last two weeks in November and in December are peak travel periods because of the Thanksgiving and Christmas holidays. If you can arrange to schedule your trip for the first two weeks in November or December, those are the easiest times to travel, and you can find surprisingly good rates. If you're determined to travel during the holiday periods, though, book your vacation flights, hotels, and cruise far in advance. If it works with your schedule, fly on Thanksgiving Day or Christmas day; those are the least crowded days of the holiday season. And if at all possible, avoid traveling during weekends, on the days right before or after the holiday, and late in the day. It's not only crowded at airports but also northern storms can wreak havoc and create weather delays that cascade across the system. During the holidays in Europe, Christmas pop-up markets open in November, bringing intoxicating tastes and aromas (mmm...gingerbread) that brighten even dreary-weather days. On Viking Cruises, for example, the Danube Waltz itinerary enables passengers to experience a variety of markets, which are great places to shop for affordable holiday gifts. Vienna and Budapest both host multiple markets, and each one is different and features different merchandise. Smaller Passau has a more intimate market, and you get to stroll through a charming town to reach it. Toward the end of the year couples who live up north start craving sun and warmth. The beaches of the Hamptons and Martha's Vineyard may be sprinkled with snow now, but you can still revel on sandy shores if you head south to Florida or west to California or Hawaii. Whether you are black-diamond skiers, bunny-hill beginners, or simply hot-chocolate connoisseurs, being surrounded by snow-tipped mountains at a ski resort during the last two months of the year can be incredibly romantic. Skiers are advised to make early reservations at resorts out west in Colorado and Utah. Locations that offer mountain thrills, as well as plenty of après-ski fun, including Aspen and Vail, Colorado and Park City, Utah. November and December are also prime time for skiers in Vermont, New Hampshire, and Maine. If you crave warmth but think the beach bores you, head to the Southwestern United States. New Age meets Old West in Santa Fe, Phoenix is still toasty and its cultural season is in full swing, and Denver makes for a great trip. And if you've never seen the Grand Canyon, winter is a good time to visit since the crowds have thinned out (but do dress warmly). Yes, it's high season and rates edge up, but that's only because everyone wants to make the scene and flee cooler climes. Whether you prefer a hotel right on the beach, one in the midst of Miami's trendy Art Deco or Wynwood art district, or a tower with horizon views and vast swimming pool, there's a place for you. And each December, Art Basel in Miami Beach brings together artists with knowledgeable collectors and gallerists. Within the Caribbean's million square miles are island nations and territories blessed by warm sun and countless beaches. Each has its own history and personality. Thanks to a wealth of romantic and all-inclusive resorts, fascinating cultures, and adventures on land and sea, they offer a variety of ways to escape winter. 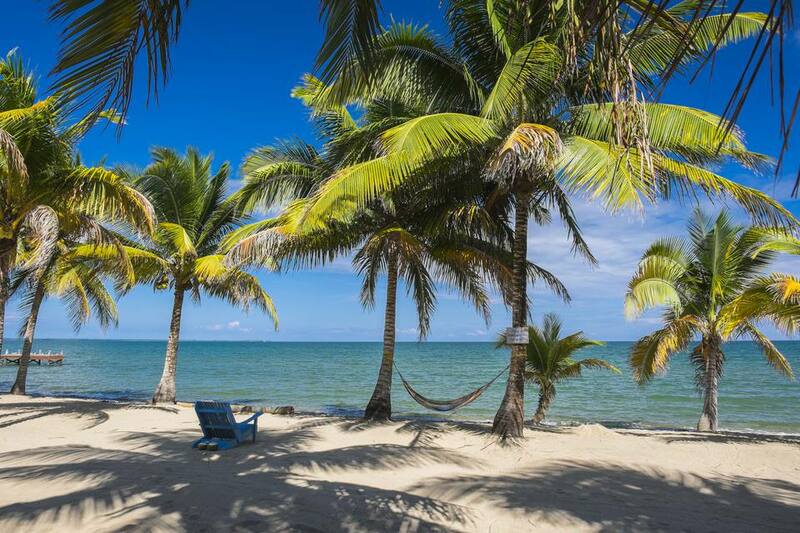 A popular choice for couples in Central America, laid-back Belize is known for terrific beach resorts as well as secluded inns in its toucan-filled jungle. Many are quite affordable in comparison to Caribbean resorts. Two more advantages: English is spoken throughout the country, and American dollars are welcome. While the rest of the country shivers, Las Vegas offers plenty of fun indoor things to do—dine well, take a chance in the casinos, go shopping, and perhaps even get married or have a vow renewal here. Except for the last week in December when prices peak the closer you get to New Year's Eve, Las Vegas is an affordable destination. The mountains of Canada include the gentle slopes of Mont Tremblant in the east to the towering ones of Whistler in the west. Note that Canadians celebrate their Thanksgiving before the United States does, which makes our neighbor to the north a particularly good place for couples who won't be visiting family during that U.S. holiday—especially if you're willing to forgo turkey and stuffing for crepes and poutine. If you really want to see the city up close, visit in November or December, when the crowds have dispersed. Hotel prices are comparatively low, and gondoliers are more appreciative of customers. And once you have your fill of religious art, head for the Peggy Guggenheim museum, which displays 20th-century American and European art in a home and garden setting. Note: October through January is the time of acqua alta, when Venice may flood. Usually it's not severe, and the city puts up wooden walkways for visitors and residents to traverse the water. Blisteringly hot in summer, Tokyo is a breeze in the cooler months. Fight the dizzying jet lag and head out for the world's best sushi or ramen, shop in the city's amazing department stores, and visit the parks surrounding the Imperial Palace in the center of the city. Escape the crowds somewhat by heading to Yanaka Ginza, which retains a bit of old Tokyo and has plenty of places to eat and shop. Do make time for a side trip to Hakone, where you can visit a Shinto shrine and see magnificent Mount Fuji on a clear day. It's getting cold out there, so consider a journey that leads you into a warm museum. Whatever your interest, there's bound to be a specialized one to engage it. If art and sculpture are your passions, discover some favorite art museums around the world. And consider that you can make a day of it soaking up culture as many contain surprisingly good restaurants to visit in between your viewing.